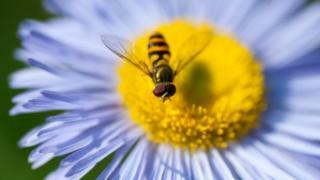 Bee diseases have been detected in hoverflies for the first time. The brightly-coloured flies may be picking up bee viruses as they forage at the same flowers. Bees and other pollinators are vital to most of the world's food crops but have been in decline in recent decades due to the destruction of wild habitats, disease and pesticide use. It's not clear if hoverflies are harmed by the viruses or are simply carriers, but, either way, they could be moving them around the countryside and over long distances, say UK researchers. "The hoverfly species that we detected the viruses in are known to migrate across Europe," said Emily Bailes of Royal Holloway University of London. "They're moving a lot further than say a honey bee would and so you could be moving different types of the viruses into new places where the bees haven't been exposed to those before." Infectious diseases have been identified as a key driver of bee population declines. Scientists have a clear picture of parasites and viruses that can damage honey bees, but much less is known about what is happening in hoverflies and other pollinators. Hoverflies themselves are important pollinators of crops and wild flowers. They can be very mobile, and some migrate long distances every year. The research, carried out in collaboration with Oxford University, looked at four types of hoverflies collected at woodland in Oxfordshire. The samples were analysed in the lab for the presence of viruses. Three common bee diseases were found in two types of hoverflies that feed at the same flowers as bees. These cause symptoms like deformed wings which lead to rapid death or the bee being expelled from the hive. "We don't really know what they're doing there yet, but because hoverflies are visiting the same flowers as bees, they could be spreading the virus around in quite a different way to the way that the bees are," said Dr Bailes. Karl Wotton of the University of Exeter, who is not connected with the study, said there are about a dozen migratory hoverflies that move seasonally through Europe and in many other parts of the world. "The numbers entering and leaving the UK each year are huge, in the billions, and all the while they provide ecosystem services including pollination and, for some species, biological control of crop pests," he said. They are almost certainly transferring pollen to create pollination networks that link across national borders, raising the question of whether they are doing the same with bee viruses. "Perhaps,," he added, "but it remains to be seen how the virus may affect the ability of hoverflies to undergo a strenuous long-distance migration or how long the virus may persist in their bodies given that no viral replication was detected."